Even though hedgehogs are “pets” they may not automatically enjoy being petted. You must first earn your hedgehog’s trust so that it can relax and enjoy your touch, rather than fear your touch as potential harm. It is o.k. 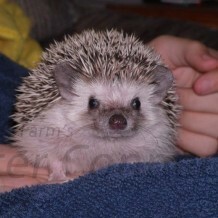 to begin to attempt to pet your hedgehog once your hedgehog is relaxed and exploring in your hands. When you notice your hedgehog pulling its “visor” down over its eyes, that is a signal to you that it isn’t quite comfortable with you yet or it doesn’t like what you are doing. When your hedgehog huffs or puffs, just relax and give your hedgehog time to relax. Don’t attempt to continue to pet it. You are actually TEACHING the hedgehog to huff and puff in your hands if you continue to pet the hedgehog when it isn’t ready for you to pet it. Give it more time just to explore in your hands so that it gets more comfortable with you. Always pet your hedgehog while it is in your hand. Never reach into the cage to pet your hedgehog unless your hedgehog is completely comfortable with you. Most people know to pet a hedgehog from front to back just as you would with any other animal. I have found that hedgehogs respond much more quickly to petting if done so that it can see your hand, smell your hand, and know what is about to happen. It is important to approach your hedgehog from the front and below eye level. The most frequent mistake I see in hedgehog handling is that most people are inclined to approach the hedgehog from behind. The easiest way to pet a hedgehog is to let it do the work for you. Once your hedgehog is moving around in your hands it is likely to “root” under your thumbs. If you are right handed you will want to hold your hedgie in your left hand. Make a “V” with your thumb and pointer finger and move your right hand up and over the hedgehog’s nose. Again, by allowing your hedgehog to see, smell, and feel your hand coming towards its face, it will be better prepared for your touch. Many hedgehogs will lay down their spines, relax, and lift their head and nose up towards your hands, and “tunnel” under your hand as you rub your hand back over its body. Use your whole hand to apply firm pressure over the hedgehog’s spines when petting your hedgehog. A firm, deliberate pressure is similar to a massage. Light pressure or a “one finger pet” over their spines is more like a tickle and it will cause the hedgehog to raise its spines rather than to relax. Some hedgehogs love their spines petted, but others may hate for their spines to be touched or stroked. When getting to know your pet, start with gentle touches wherever your hedgehog seems not to mind. Places some hedgehogs like to be scratched include: their ears, chin, along the edge of their quill line or skirt, belly fur or feet. Other hedgehogs may not like to be touched anywhere near its face and may be especially protective of its feet. Some hedgehogs, frankly, do not liked to be touched. They may be much more comfortable getting to know you by exploring on or near you.